If you’re shopping for your dad, brother or other guys this holiday season, you can usually do well by picking out DVDs or Blu-rays that they’ll love. 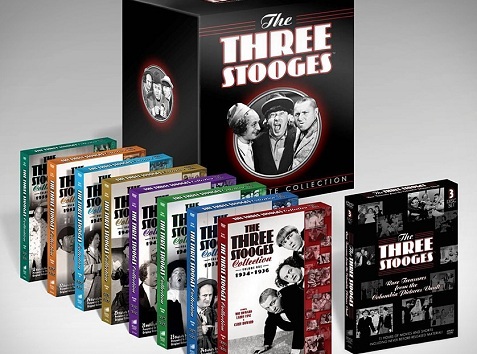 With the introduction of “The Three Stooges Ultimate Collection” on DVD earlier this year, you might just have the perfect gift for tons of guys. We all love slapstick and stupid humor, and nobody does it better than the Three Stooges. Many of us grew up watching these nuts on TV, and now we can have their entire catalog in one DVD box set. The Three Stooges were the longest-running comedy act in motion picture history. The team included Moe Howard, Larry Fine, Curly Howard, Shemp Howard, Joe Besser and Joe Curly-Joe DeRita. Most will agree that the best shorts include those with Curly or Shemp of course, with Curly probably being the most popular. Still, Shemp was always underrated. This collection features over 60 hours content, with the entire Three Stooges Columbia shorts catalog spanning three decades and 190 shorts. It also includes three discs of rare and unreleased content. Extras include several of the Stooges work separately in solo shorts, 28 never-before-released short films starring Stooges actors Shemp Howard, Joe Besser, and Joe DeRita, as well as feature length films. This 20-disc set will be the ultimate gift for any Stooges fan. Check out our Holiday Gift Guide for more gift ideas, and check out these classic Stooges scenes as well.